Your assets are your people, your capital, and your reputation. If any of these is ever damaged, the last is the most difficult to restore. 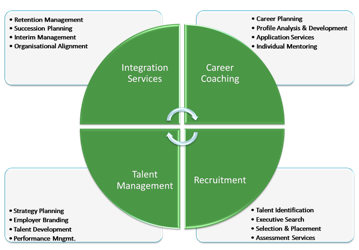 In particular in human capital intensive areas, it is imperative to recruit, integrate, train and retain skilled personnel at all organisational levels. 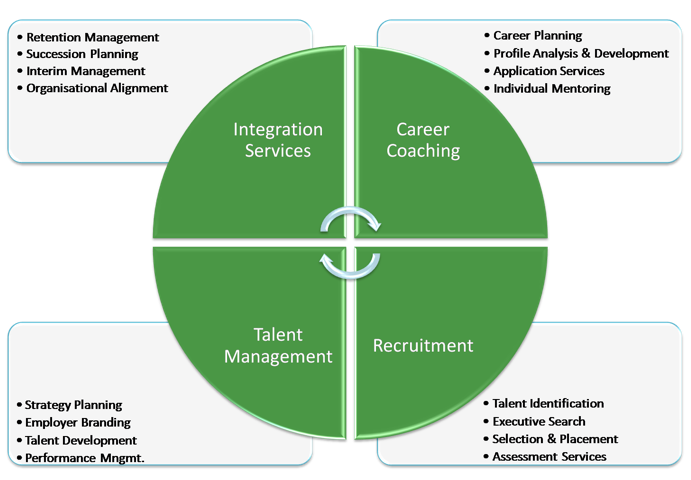 Thus, we conceive human capital management as a holistic system starting from preparing top-tier individuals for their professional future (career coaching) and placing their application in the right firm (recruitment) to strategic personnel development (talent management) and securing the most optimal integration of a firm's highest asset, its employees (integration services). In our recruiting activities, we follow a very systematic and methodological approach applying the latest instruments in human resources management (e.g. extensive individual profile analysis based on international standards). Our detailed screening for client assignments involves both our extensive database of present candidates and the direct contact of new potential individuals. Due to our strong and personal relationship to some of the world's most renowned academic institutions and business schools, such as the Universities of Harvard, Oxford, Cambridge, Heidelberg, St. Gallen and the Swiss Federal Institute of Technology as well as the London School of Economics and Political Science (LSE) and the London Business School (LBS), we have been successfully recruiting highly talented individuals with outstanding academic and professional record exclusively for our clients. Constant scientific and technological innovation challenge and change our learning needs and patterns. Our experienced coaches and specialised academies help you develop human capital effectively and train personal successfully. In order to facilitate the effective delivery of strategic and operational goals and to unlock the latent potential resulting in direct financial gains, a motivated workforce and an improved management control, we advise you in competitive assessment as well as coaching and development. Congentis Human Capital provides interim management services for organisations that need senior executives on a short-term basis to strengthen their own management team, to lead a project or to transform their business. In an increasingly complex and competitive work environment, it is important to plan your career strategically. Congentis systematically analyses your profile and potential in order to find the best platform for you to grow both professionally and personally. Congentis is a professional recruitment firm that not only identifies and selects promising candidates, but effectively places your application in the right company and career position. Contracts play a crucial role not only for the company and its management, operations and business activities but also for the candidate and his professional career. Congentis helps you define and review vital elements of your contract and assignment. In a globalised economy, it is increasingly important to plan your career strategically and well ahead. We direct, instruct and train you in order to achieve your individual goal and develop relevant essential skills. In order to meet the challenges of a successful professional career, we not only provide you with advice as many other human capital consultancies but also with own specialised academies, workshops and seminars worldwide.